French Country Style is one of the most beloved styles of decorating today. When people envision country french style they think of beautiful, time-worn stone chateaus dotting the countryside of Provence. Weathered stucco exteriors greet visitors with distressed wood doors, and vibrantly painted shutters. Interiors welcome you with a blend of elegant and rustic furnishings. 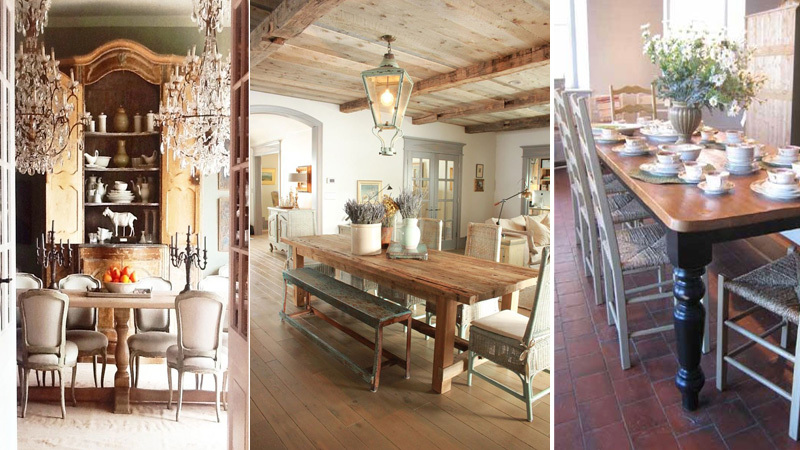 But, how can you create the feeling of French Country in your home? Learn more about the history of French country style and a few tips on how to create a French-inspired interior decor in your home. Some key element include using vivid “Provence” paint colors, blending of distressed and ornate furnishings, and a mixing of patterns and scale, to create a perfect French-inspired home. It’s a blend of old with new that make country French style popular and sustaining. French Country Decorating elements include use of ornate lighting, juxtaposed by rustic wood tables, painted furniture, and large scale accessories. The style originates from French designs found in palaces in France beginning in the 1600s. 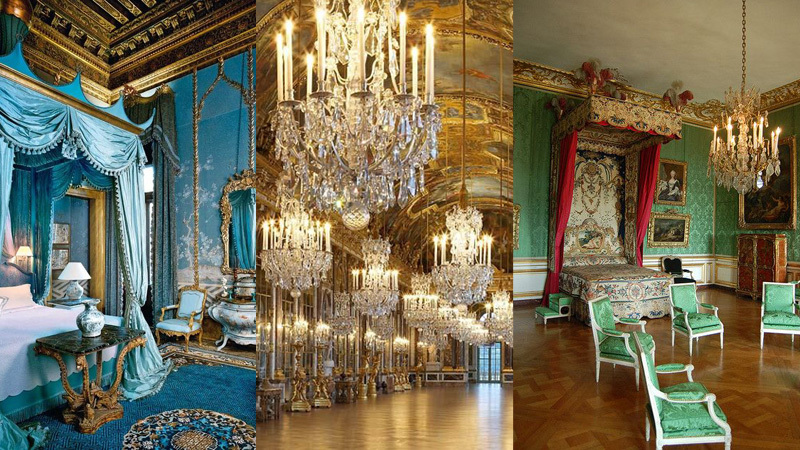 Louis XIV spearheaded a movement to make France the arbiters of style and refined taste. During this movement, the King lead a renovation of the Palace of Versailles employing the best craftspeople and artists in the country. Whether carpenter, furniture-maker, textile weaver, glassblower or ceramic artist the utmost goal was to design the most upscale and luxurious products for the world to envy. The King made certain that his extraordinary French style was not only popular in Parisian markets, but, markets all over Europe by the 18th Century. As time passed, French style was sought after by the masses who lived in simpler country homes. People yearned for high-style of French goods but adapted them to meet the needs of everyday living. This is when “country french” style began. The tenants of French country decorating align with traditions of the past—proportions, balance and fine craftsmanship. The French country style focused on the importance of family and everyday use of the home. The result is a decorating style that is richly sophisticated yet relaxed to live in. 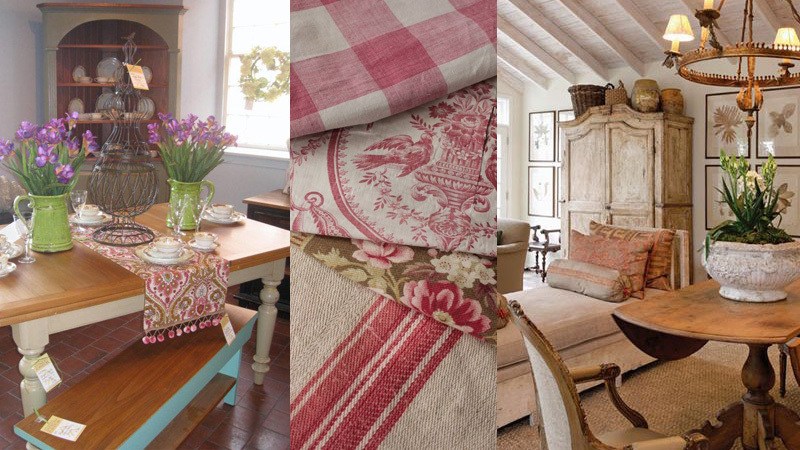 French country style today includes wood furniture, painted armoires, mixed fabrics, and patterns. • Color: Rich tones, and vibrant hues are at the foundation of french country design. Provence blues, yellows, terracottas, reds, earthy browns and greys are the basis of good country french design. • Furnishings: Spanning from an ornate Louis XV mirror to a clean-lined, rustic farm table with Ladderback chairs—French country is a blend of old and new. Painted armoires are commonly used as focal point in country French decor. It’s the blend of rustic wood, painted pieces, metal, glass, gilt that makes country french so adored. • Patterns: Skillfully mixing of scale, and proportions makes an eye-pleasing decor. The intricate details of toile fabrics are mixed with large buffalo check prints and animal tapestries. It’s this unique blend that creates interest in the room. • Fabrics: Influenced by the size and scale of the room, fabrics are used from chintz to toile to cottons and linens and blended for a layered look. • Floors: Rustic flooring from wide-planked wood floors to brick or stone set the rustic, relaxed tone of the room. • Accessories: Country french is a blended mix of an ornate crystal chandelier with a wrought iron. Large-scale earthenware ceramics painted in colors of Provence, baskets, woven rugs, and fringed throw pillows complete the decor.